For a women’s hockey program that has experienced so much success in the past thirteen years, a season such as this past one seems uncharacteristic. Since head coach Rick Osborne first stepped behind the Laurier bench in 2003, the team has won an astounding nine OUA titles, including a stretch of seven in a row from the 2003-04 season through the 2009-10 season. The team also took home a CIS championship in the 2004-05 season as national champions. With only three wins in 24 games in the 2016-17 campaign, all Laurier can do is look to the future. That future being one that looks very bright if the play of one rookie continues. 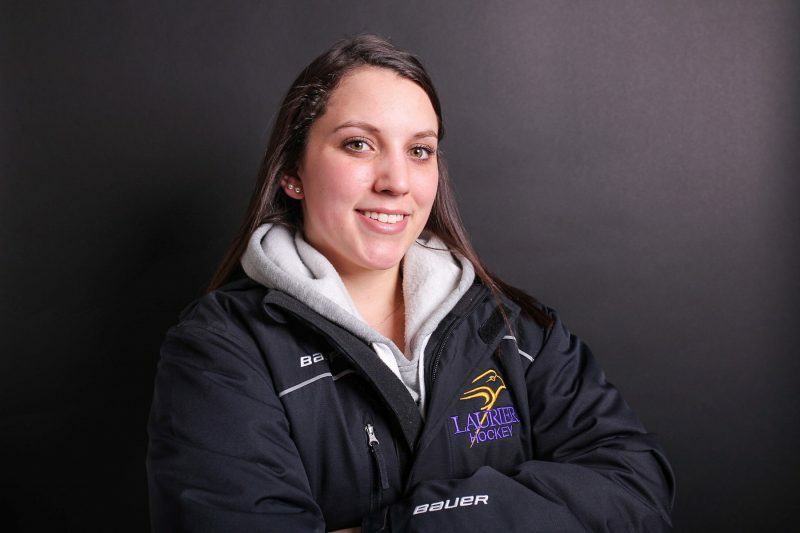 First-year forward Emily Woodhouse was a beacon of hope for the Golden Hawks this past season, leading the way with a team leading ten goals and twelve points. Her standout play led to her being named to the OUA All-Rookie Team this past week. Hailing from St. Marys, Ontario, Woodhouse credits the team’s veteran group of players for helping to make her adjustment to the OUA as successful as it was. “There was a big difference in the training and the speed I had to do coming from junior to the OUA because it is a lot faster and a lot more physical [sic],” said Woodhouse. Woodhouse’s scoring accounted for over one-third of the Hawk’s total goals (10 of 28) in the season, meaning that she needs to come back in the fall ready to lead the team’s offence, a responsibility she cannot take lightly. She said that her and the team are putting a lot of effort into their off-season training, to make themselves stronger and ready for a return to the playoffs. The kinesiology student also plays with a lot of grit on the ice, leading the team in penalty minutes and finishing top five in the OUA with thirty-six. Woodhouse credits her line-mates as a large part of her success. “I would say I had the right line chemistry in my line. We knew where to find each other, knew where to pass, they really set me up for all of my goals,” she said. In the first year of her Golden Hawks career, Woodhouse’s play has put the OUA on notice and a future selection as a First Team All Star is more than possible if she continues to build on her success from this season. Her development will be a large part of the next few seasons for Laurier hockey.